AMS All School Party TODAY! End of Trimester Party for all AMS Students! Admission is free for open gym, dance space, face painting, Bingo, and a board game station. Concessions will be for sale. Students are to stay inside the supervised event. When they leave the event, it is expected they leave campus as no re-entry will be allowed. Thank you for quick pickups at 4:30. 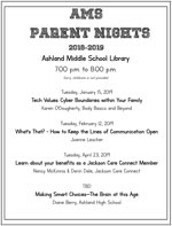 Calling all 8th grade parents! High school is just around the corner. Come to a presentation where you will learn everything there is to know about the transition from AMS to AHS. 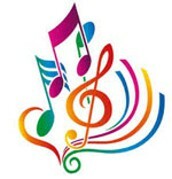 AMS is Alive with Music! March 19th @ 7:00 p.m. When: 7:00 p.m. to 8:00 p.m. Sorry, childcare is not provided. Volunteers needed for HOME track meets! 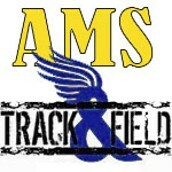 In order to put on quality track meets here at the middle school we need your help. Don’t worry you don’t need experience, we will train you. Please make sure you have turned in a volunteer application for this school year. Dates for home meets are: April 18th, April 25th and 6th Grade Districts on May 1st. Timers-Be at the finish line for all races. It’s useful to have prior experience, but not necessary. Recorder-Record the places and times of each race at the finish line. Scorekeeper-Process the results for race and field events, keep track of times/finishes, provide current team scores. Announcer-Announce all of the upcoming events so that athletes can be on time. Starter-Start each race. Previous experience is helpful. Long Jump Official-Measure and record jump attempts, rake the sand back into place between attempts. Discus Official-Assure they made legal throws. Measure and record their discus throws. High Jump Official-Set the high jump bar, determine if jumper clears the bar. Measure and record their heights. Shot Put Official– Assure they made legal throws. Measure and record their shot put throws. Thanks so much for considering to help our track team this season. Please email Jim Hageman if you can help us out. Monday, March 11, 2019—Have fun with us!! The First 30 to register are guaranteed a spot - Attach check for $25 and return to AHS office no later than Wednesday, March 6 at 3 pm. Waiting List will be contacted. Supervisor: Mrs. Bishop 6:00 -9:00 p.m. Cost $25. 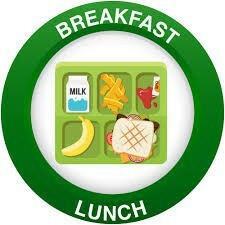 Healthy snack will be provided: If students have a special diet, please include some snacks as well. Your high school student (in 2020) is invited to join a once-in-a-lifetime international travel experience with their peers during the summer of 2020 to LONDON! Please come to hear all the details including the destinations, itinerary, and cost of this trip as well as the official opening of enrollment! This meeting will be held on Tuesday MARCH 12th at 6:00 p.m. in the Rose Studio. There are limited spots left on this tour. I would love to have you attend this meeting to learn more about this exciting opportunity! 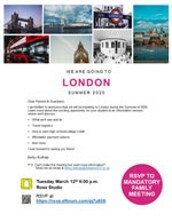 Please click here https://rsvp.eftours.com/pj7u656 to RSVP by the end of the day Monday March 11, 2019 to confirm your spot at the meeting. Please note that you MUST RSVP in order to attend the mandatory informational meeting. 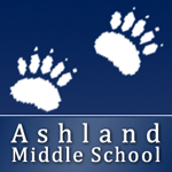 The AMS Students are invited to join the Co-Ed Rowing Team this spring sports season. Welcoming new rowers now, no experience necessary. 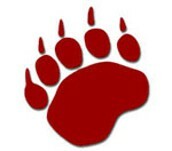 The Development Team meets, Tuesday, Wednesday, Thursday from 4:15-6:15. There is a Racing Team also available for middle school students. 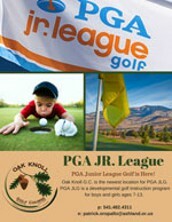 PGA JR. League Golf is Here! PGA JLG is a developmental golf instruction program for boys and girls ages 7-13. Team practices/tryouts will begin on Monday, May 13th. Practices will happen twice during the week. Matches are typically on Saturday or Sunday. Try Water Polo For A Week! Middle Schoolers are welcome to join water polo this spring! NO tryouts or experience necessary! Spring water polo is open to boys and girls in grades 6-12 and the season begins on April 1. The first week of practice is completely free and an opportunity for new or interested players to get in the water and see what it is all about! 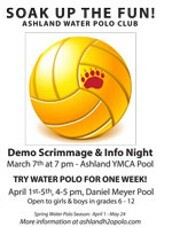 Visit www.ashlandh2opolo.com for more information! Ashland Parks is offering an opportunity for the youth of the Rogue Valley to participate in restoration and riparian work in Ashland parks and trails during our summer Youth Conservation Corps (YCC) Program. Incoming 8th-12th graders will earn 25 hours of community service per four-day session: June 10-13, June 24-27 and July 8-11. Healthy Hands Cooking presents, The Mystery Box Cooking Class. Students will create an entire dish as well as dessert using mystery ingredients and standard pantry ingredients. Academy Sports serve as a tool for higher learning that will foster the development and improvement of skills and knowledge integral to playing the game. Awaken summer imagination with a night of fun at the Y! Summer is the time for kids to get up, get out and grow. Bring the family to the Y to experience all the Y has to offer your kids this summer! 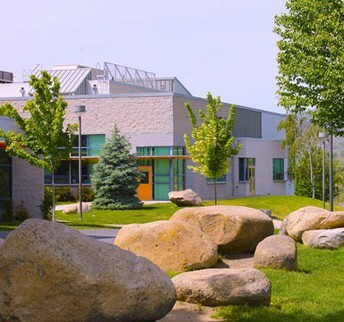 Activities include: STEM tables, sports, bounce house, swimming (with our new large water obstacle course), crafts, Community Partners AND so much more! Join The SOU Lacrosse Club! This newsletter can be translated into many different languages. To use this feature please click on the link below. Then scroll to the bottom of the newsletter and click on "Translate". You will then be able to select the language of your choice. Student Achievement Snapshot through PowerSchool. Complaints may also be directed to: Office for Civil Rights, U.S. Department of Education, 400 Maryland Avenue S.W., Washington D.C. 20202, or by calling (800) 421-3481 or (877) 521-2172 (TTY).